Iran has the very real potential to be the world’s greatest energy disruptor, provided that all of its oil and gas eventually gets to market (and it’s predicted that the Europeans and Chinese will be working at a feverish self-interested pace to expedite this). If it comes to pass, then Russia and Saudi Arabia would receive major blows to their budgetary and economic forecasts, possibly even resulting in some sort of social destabilization as a forerunner to US-planned political unrest, which is why these two actors have the most to lose if Iran decides to disrupt the system (for maximum economic benefit to itself). Strategically speaking, Russia is actually even worse off than Saudi Arabia because it has the most to lose in terms of its regional influence and grand strategy if Iran builds pipelines to Europe (and even more so if it assists Turkmenistan with doing the same). If Iran’s energy riches are largely directed towards feeding the hungry Asian market and invested primarily in LNG, then Russia and Saudi Arabia would both have substantially less to lose, but they’d still be facing a strategic loss regardless. The current situation can be summed up with the following dilemmatic axiom: the closer that the US and Iran move to one another, the more suspicious this makes Russia and Saudi Arabia; likewise, the closer that Russia and Saudi Arabia move to one another, the more suspicious this makes the US and Iran. In both instances, each pair feels compelled to continue moving in their newfound direction out of fear that failure to do so would place it in a comparative disadvantage vis-à-vis its primary rival’s engagement with its thought-to-be ally, as such is the nature of this strategic security dilemma. Russia and Iran want to save Syria, while the US wants to destroy it. The Saudis had attempted to crush the country but obviously failed, and now they seem possibly open to a deal (likely conducted bilaterally with Russia) to enact a ‘face-saving’ pull-out to focus on their efforts on ‘winning’ the War on Yemen. If Russia and Saudi Arabia reach such arrangement, then that would leave the US and Turkey as the only two significant actors to be continuing the War on Syria, which of course could make the battlefield situation much more easier for the Syrian Arab Army (provided that the US and Turkey don’t launch a conventional invasion first or in response to Saudi Arabia’s retreat). Iran is in favor of the Houthis, while the US and Saudi Arabia are fighting to restore ousted President Hadi to power. Russia is pretty much on the sidelines in this entire mess, powerless to enact any real change in the situation except to possibly reach a deal with Saudi Arabia for it to transfer its proxies from Syria to Yemen in exchange for advanced weaponry and deeper bilateral cooperation. Yemen has become something of an obsession for the Saudis, so it’s probable that they would be interested in any likeminded Russian proposal, but of course, even though this would save Syria, it could also enrage Iran, which might see Russia as having conspired against Iranian interests in the southern Arabian Peninsula for what it may feel is no necessary reason (or even worse, an opportunistic one). In the 1980s, the US and Saudi Arabia created Al Qaeda to fight the Soviets, and they also cooperated with one another in waging the first oil war against Moscow. The effects of this twin-tracked anti-Russian campaign was for the US to eventually be attacked by the same terrorists that it once supported, but neither they nor the Saudis ultimately received any lasting negative impact from the oil campaign. In 2014-2015, despite the strategic template for American-Saudi geopolitical sabotage being similar, the consequences of strategic blowback couldn’t be any more different. The US and Saudi Arabia helped created ISIL, but it turned around to attack the Kingdom twice, and the oil war that the two were cooperating in somehow spun out of control to inflict damage on both of them and turn the two partners into fierce energy rivals. All of this, it appears, is to the Saudis’ detriment and less so to the Americans’. Saudi Arabia and Iran couldn’t have more divergent motivations for their possible reorientations. Saudi Arabia fears economic sabotage by the US due to the oil war; feels itself under asymmetrical pressure by American-guided ISIL; and is experiencing what it seriously views to be a strategic rejection by the US in favor of Iran. On the opposite side of understanding, Iran thinks that it secured itself from conventional and Color Revolution attack (the latter always being a threat, whether Tehran realizes it or not); stands on the cusp of an economic bonanza from investment, pipelines, trade, etc. ; and feels vindicated and proud that the West recognizes it as a Great Power. To sum up their differences, Saudi Arabia has everything to fear, while Iran has everything to be excited about (or so it believes), and these spectrum-opposite ‘emotions’ (if one can personify these states for a moment) are the primary motivations behind their respective outreaches to Russia and the US. 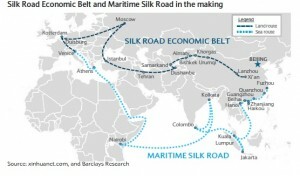 Iran is a key node on the New Silk Road, and if it becomes a focal point of rapid Western investment there (which is what both sides want), then it would consequently become a Western outpost along the main non-Russian New Silk Road continental chokepoint. The West could ‘play nice’ in the interest of mutual profit and ‘let the good times roll’, but as explained in Part I, if the proper political motivation comes up to return to sanctions to at least threaten to do so (e.g. 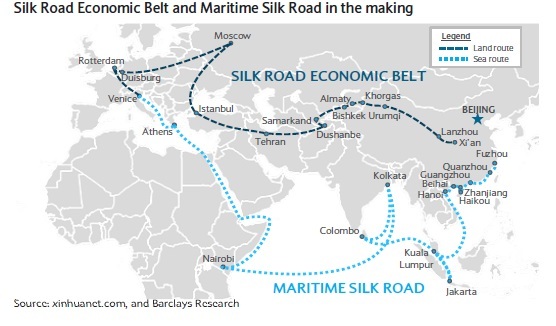 Iran doesn’t follow the West’s ‘advice’ to aggressively promote its interests along Russia’s southern former Soviet frontier), then they’d be turning their investments into strategic disruptors not only in the heart of Iran, but also in the heart of the New Silk Road. Iran sincerely thinks that it can have the best of both worlds and deal equally with the West and the New Silk Road, but the Chinese and Russians have never invested anywhere and then pulled out or threatened to do so, but the West has, and their lengthy history of sanctions (not least against Iran itself) testify to this fact. If forthcoming Western investment can get Iran to establish a tight enough economic dependency with it, then they can exploit this process at any time of their choosing for the chosen geopolitical reason (“activate the time bomb against Iran to harm Russia/China”). The US awaits the day that it can use Iran as an indirect proxy of destabilizing influence against Russia’s southern former Soviet periphery. Part I touched upon this possibility in citing the Hoagland-Blinken Doctrine for Central Asia and how it holds open the prospect of strategic collaboration with Iran in penetrating that region. While short in words, it’s big in implications, and with Iran feeling rightfully confident and newly assertive as a result of its nuclear ‘victory’, it could very well be guided into a ‘Northern Pivot’ of influence projection along the Caucasus, Caspian, and Central Asia if ‘properly’ manipulated. This would relieve Saudi Arabia of whatever ‘pressure’ it feels and ease some of its anti-Iranian paranoia, which could help the US convince them that the deal wasn’t ‘so bad’ for its interests and thus work to reverse the Russian reorientation to a certain degree. This would leave Russia as the biggest loser, since it wouldn’t really have anything to show for its advances with Saudi Arabia, and it would also have a heated rival in Iran (which would be behaving that way both for its own ‘self-interested’ reasons [supported by the US, directly or indirectly] and perhaps even to pay Russia back for its prior relationship with Riyadh). One of the main factors at play here is that President Putin needs to walk a fine line in his country’s relations with Saudi Arabia and Iran. He must balance the changing nature of the Mideast’s strategic reality with both Russia’s new (Saudi Arabia) and existing (Iran) interests, but the US wants to pressure Russia to ‘take sides’ so that it can set itself up for a strategic trap of ‘double isolation’ (burning both bridges at the same time as a result of failed diplomacy, per what was just discussed in the above theme). Moscow has taken to exercising masterful diplomacy in the past couple of years, but the stakes in managing relations with such large, important, mutually rival states as Saudi Arabia and Iran are historic and a lot more difficult to handle that that of Armenia and Azerbaijan, and could literally be a make-or-break moment for the Mideast that sees Russia promoting/losing its overall influence there with the resultant peaceful/disastrous consequences. Also, if played perfectly right, then a reasonable scenario could develop where the US ends up as the big loser, falling into its own trap of ‘double isolation’ and finding itself squeezed out of the region that it once controlled so firmly.